One thing that I've learned over the years is that nothing performs better in the winter than a dedicated winter tire. Since I've always believed that tires are critical to vehicle safety, it was no question that I would be buying a set of winter rims and tires for our 2007 GMC Yukon XL Denali. Even thought the Denali has full-time AWD, winter tires would make sure that we would be able to stop as well as we could go. The only question was the type of rims I would on the Denali. Ours came with 20" wheels. The standard Yukon comes with 17" so those were the two options that were available on TireRack.com. I looked at 17" rims at first because I figured that they would be lighter, give us the most options for tires, and allow me to install chains if I encountered anything really serious. Plus, I was sure that 17" wheels would be much cheaper than 20" ones. ...not available in light truck/SUV sizes, so after doing a little research online I decided that the Bridgestone Blizzak DM-Z3 in 265/70-17 would be the best choice for us. I originally wanted to pick a cheap 17" rim but discovered that some weighed a whole lot more than others and not all rims accepted TPMS (tire-pressure monitoring system) sensors. That made the selection process a little more complicated because I don't like making mods that reduce performance--especially with a heavy wheel. Don't forget that beauty is in the eye of the beholder and not all wheel styles were appealing to me. What complicated the decision even more was that I started to think (which is a dangerous thing!) that I would get more use out of an A/T tire like the BFGoodrich All-Terrain T/A KO tires that I had on my 2003 Toyota Sequoia. They are rated with the mountain snowflake symbol for severe snow conditions and I know they worked well in the snow. (See Brohm Ridge Trip Report.) I thought that in addition to using them for the winter, if I wanted to explore some logging roads in the summer, the BFG A/Ts would perform way better than the all-seasons on 20" rims. Would that mean I would run 17" rims all year long? Or would I just swap the wheels each weekend for some fun? Knowing how much I dislike extra work, I started to wonder if I would like having 17" wheels on the Denali full-time. I really do like big rims and I think it suits the Denali well. Maybe I wouldn't be doing too much off-roading anyway. I did a search on TireRack for a 20" winter tire package and found that they had some rims that looked reasonably nice on close-out at $119 each. That was a lot cheaper than even some of the 17" rims I was looking at. Having a limited budget (cheaper is better) and realizing that I liked the look of 20" rims, I decided that off-roading was not the primary purpose of the Denali (which couldn't do real off-roading anyway without true 4x4 capabilities). I placed my order with TireRack. The only winter tire available in 275/55-20 was the Bridgestone Blizzak DM-Z3 that I wanted so that was good. What wasn't good was that they were back-ordered and not expected to be available until the beginning of November. I canceled my order and thought maybe I would try this season without winter tires. That didn't sit well for me so I started looking at 17" options again. The wheels I liked were much more expensive than the close-outs so I decided to make a compromise on the tires. I chose the Firestone Winterforce (studdable winter) 265/70-17 which got fairly good reviews on TireRack. They are only $85 per tire and will off-set the cost of the wheels at $182 per rim. I went back and forth between black and silver rims, but decided on ATX Thug 17x8.5 wheels that are black with a Teflon coating. That should help protect them from the winter elements. Also, with 17" rims, if I want to get the BFG's in the future, I still can without having to buy a whole new set of rims. So after a couple of weeks of hemming and hawing, I placed another order with TireRack on the weekend. 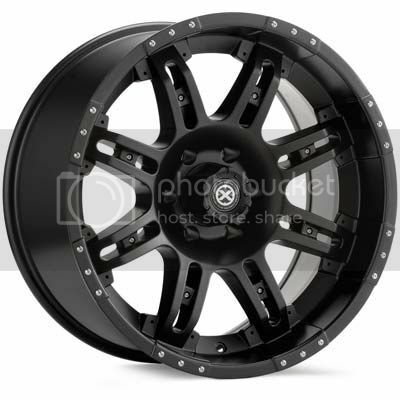 These tires and wheels are in stock, so hopefully I'll be able to pick them up at the end of the week.